This 215-mile/346-kilometer drive captures a quintessential slice of Oregon scenery as it winds along the lush western slope of the Cascade Mountains, where some of the state’s best-known rivers spill through timeless fir forests. The West Cascades seem to burst with life, a paradise of green with water at every turn. Mountain lakes are scattered among old-growth forests. Hot springs bubble up from deep in the earth. Winter rains and spring snowmelt feed creeks that tumble down the mountainside and grow into powerful rivers, like the Clackamas and the Santiam, two of the great waterways that accompany this route. Bring a fly rod, a camera, a mountain bike — or simply the time to explore and enjoy this byway’s beauty. The byway begins in Estacada, just beyond the Portland metro area and the southern flank of Mt. Hood. The construction of a large hydroelectric dam and the arrival of the railroad brought logging and tourism to this wilderness in the early 1900s. A designated Wild and Scenic River, the gorgeous, jade-green Clackamas River carves a deep canyon south of town. The byway heads south high above the river, dipping and climbing through folded foothills of fir and pine. Soon it descends with frequent pullouts at river level, a popular stretch for fishing and white-water kayaking. The Upper Clackamas Whitewater Festival is the oldest and largest white-water event on the West Coast, drawing participants in kayaks, in canoes, on rafts and on stand-up paddleboards. As the route enters the Mt. Hood National Forest, you’ll pass several riverside campgrounds and trailheads. 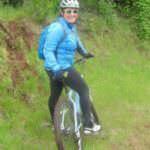 The Clackamas River Trail runs 7.8 miles/12.5 kilometers along the opposite bank of the river. It begins at the Fish Creek Campground bridge and ends near the Indian Henry Campground bridge, making it easy to arrange a shuttle hike. Beyond the Ripplebrook Ranger Station, the byway continues on FR-46. The Riverside National Recreation Trail winds along the river’s east bank under fat hemlocks and firs. The route swings south on FR-46, skirting the Olallie Lake National Scenic Area. A lodge and several trails — including the Pacific Crest National Scenic Trail — curve among dozens of mountain lakes on a plateau just north of Mt. Jefferson here. Continuing west through a tunnel of trees along the Breitenbush River, this is a lovely stretch in autumn, ablaze with fiery vine maple. Well-known hot springs here are part of a 60-acre retreat center. The South Breitenbush Gorge National Recreation Trail leads along the river’s south fork and to a spur trail where the waters squeeze through a narrow basalt gorge. The byway pops out of the forest at the junction of OR-22 and Detroit Lake, popular with boaters and anglers. A dam on the Santiam River created this flowage, which, at high water levels, can have as many as 32 miles/51.4 kilometers of shoreline. The Detroit Lake State Recreation Area has campsites and boat launches for day-trippers and overnighters alike. 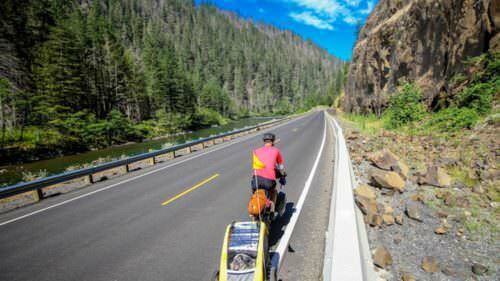 The route follows the Santiam River south through the Willamette National Forest on a deeply forested corridor. The corridor passes several campgrounds and trails that spin off into the woods and up toward 10,497-foot/3,200-meter Mt. Jefferson. Visitors can tour the Marion Forks Hatchery, where chinook salmon and rainbow trout are raised for release into nearby rivers and lakes. Past the hatchery, the Quartzville Back Country Byway (FR-11) eventually follows the Wild and Scenic Quartzville River, accessing old-growth forest, flowages and a recreation area where the public can pan for gold. The West Cascades Scenic Byway climbs up to Santiam Junction, where it turns west on US-20, then south on OR-126. This stretch of the byway showcases the beautiful blue waters of the Upper McKenzie as it tumbles over waterfalls and through lava flows. From the junction of US-20 to the junction with OR-126/242, it shares the route with the McKenzie Pass-Santiam Pass Scenic Byway. At OR-126, the road swings west at Belknap Springs, where a mineral springs spa has operated for nearly 150 years. Farther west past McKenzie Bridge, the Belknap Covered Bridge spans 120 feet/36 meters and is strong enough to support logging trucks. There has been a covered bridge at the site since 1890. This bridge was built in 1966, after a flood destroyed the previous one. The byway intersects here with the new McKenzie River Scenic Byway. The final leg of the trip continues along the south fork of the McKenzie River on FR-19, also known as Aufderheide Drive. Near the Delta Campground, stretch your legs on the Delta Old Growth Nature Trail, a half-mile/0.8-kilometer loop among centuries-old western red cedar and Douglas fir. Cougar Reservoir is named for the big cats that inhabit the area, although you’re more likely to see plentiful deer and elk. The road climbs to Box Canyon, where trails lead off into the Three Sisters Wilderness. The byway leaves the McKenzie behind and soon meets up with the Wild and Scenic North Fork Middle Fork Willamette River. The superb scenery continues, tunneling through a deep canyon. In Westfir, the barn-red Office Covered Bridge (Oregon’s longest at 180 feet/54 meters) stretches across the North Fork Middle Fork Willamette River — an enchanting conclusion to this scenic tour. 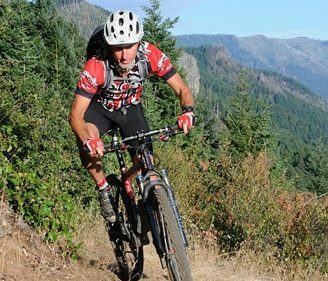 Just next door, the town of Oakridge is a hub for mountain bikers, with miles of single-track trails twisting through its wild forests. Order a free Oregon Scenic Byways guide, or view a map of the West Cascades Scenic Byway online.